The older style, with tiled flooring and red signage. 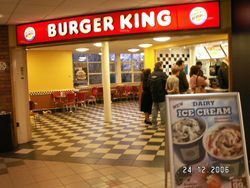 Burger King has become extremely common on the motorway, with Moto, Welcome Break and many of the lesser-known services all making it available. The chain was started in 1954, and has spread to more than 100 countries. Its roadside success started when Pavilion opened the first four in 1993, aiming to provide a recognisable name and a quick service. Meanwhile, intimidated by Welcome Break's success with Julie's Pantry, Granada launched four takeaway burger joints called Burger Express. When Pavilion were bought by Granada, they wanted to take advantage of the Burger King partnership and opened another 50. Under their watch, Granada added a Burger King to most of the sites they owned, including Welcome Breaks and Little Chefs. Granada would provide a Burger King wherever it would fit, with seemingly no consistency between brands. Some were just a sales point with no seating, others had a large, dedicated seating area. The Burger Expresses and Julie's Expresses were converted too. Burger King's exclusivity came to an end in the late 2000s, when Roadchef, who had previously worked with Wimpy and The Burger Company, signed a rare franchise agreement with Burger King rival McDonald's. At the same time, McDonald's had been opening restaurants across the A-road network, making them the more common sight for drivers. Meanwhile, Welcome Break have placed Burger King alongside a number of other fast food names, even removing Burger King where space is tight. First, another Burger King partner, sold their services to other operators. In 2012 Moto, the only operator now relying solely on Burger King to fulfil its fast food demand, started experimenting with KFC and later specialist fast food brand Chow. In 2018, they committed to introducing more KFCs, implying Burger King could be about to be pushed to the side. At Little Chef, most of the Burger King franchises were removed in 2004. In 2015, new owners began to bring the Burger Kings back. Euro Garages then inherited these franchises. 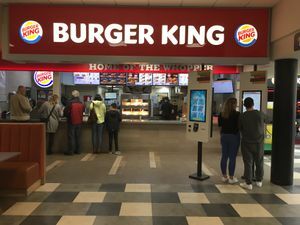 In response to the growing competition, Burger King have tried to move away from their American roots by refurbishing their restaurants with a more modern look, with features such as self-service drinks machines and touch-screen ordering.